Fredrick Richard (Rick) Honeywell, Chief Master Sergeant, United States Air Force (retired), died on Monday, November 4, 2002, at age 42. 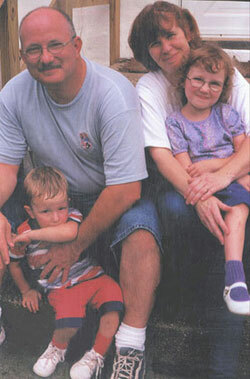 He leaves behind his wife, Christina; daughter, Megan, age 7; and son, Daniel, age 5. He is also survived by his mother, Loretta Honeywell of Cranford, New Jersey; his father, Forest Honeywell of Littleton, Colorado; brothers, Forest, Patrick, and Steven Honeywell; and sisters, Katheleen Honeywell and Michelle MacNamara. Rick grew up in Cranford, New Jersey, and joined the USAF when he was 19 years old. He enjoyed the field of Aircraft Maintenance and was proud to serve his country. He was stationed in and deployed to many places around the world throughout his military career. His last battle was a personal one, with multiple myeloma, which he fought with the courage and determination that underlined his life. He will be sorely missed by his family and friends. Funeral services will be at Arlington National Cemetery on December 10, 2002, at 1:00 p.m. EST. Friends and colleagues are welcome to attend. In lieu of flowers, Rick's family requests that you consider a donation to help find a cure for multiple myeloma. Send donations in honor of CMS Rick Honeywell to the International Myeloma Foundation, 2129 Stanely Hills Drive, Los Angeles, CA 90046. Several local Friends traveled to Arlington National Cemetery on December 10, 2002, to attend a service and burial for Rick Honeywell, husband of former attender Chris (Bower) Honeywell. Rick died on November 4 following eight months of illness in Texas. Chris and Rick are both members at Lubbock Meeting. We joined Friends from South Carolina and many family, friends and fellow Air Force service people for a very meaningful ceremony. Rick was honored by a full military honors service, complete with an honor guard, grey horses drawing his casket to the burial site, a gun salute, taps, and a rich Quaker silence. Condolence notes to Chris and her children, Megan and Daniel, can be sent to her parents at Chris Honeywell c/o Bowers, 2576 Cape Horn Road, Red Lion, Pennsylvania 17356. Rick Honeywell, born on 10 January 1960, diagnosed March 2002, died November 2003, with wife Chrissy and children Megan and Daniel. Rick adored being a husband and dad, and really enjoyed his job of Chief Master Sergeant in the USAF. A memento he received from the other Chiefs at Dyess AFB says, "Chief Rick Honeywell .... Leader, Mentor, Friend." We'd add to that, "Husband, Daddy, and the warmest man you'd ever hope to meet. Sorely missed."